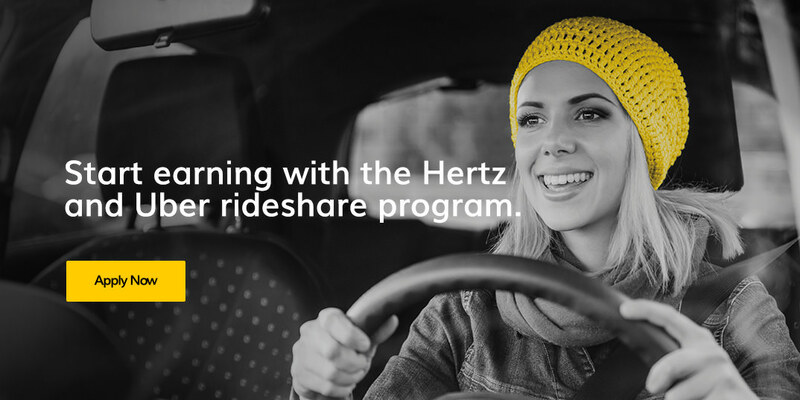 Start earning with the Hertz and Uber rideshare program. Need a car to earn with Uber? We've teamed up with Uber to offer rental cars so you can drive on your own terms. Here’s how the program works, where to book, what's included, and eligibility requirements. You’ll then have the option to select a vehicle offer and set up a pickup appointment at a Hertz location near you. A 7-day reservation is required. Head to your Hertz pickup location at the date and time you selected. You can pay for your rental using a credit or debit card. Prepaid or stored value cards are not accepted. You can extend your rental up to 3 times, every 7 days. Every 28 days, the vehicle needs to be returned to the Hertz rental branch to open a new 28-day contract. Return your vehicle to the Hertz branch location where you picked it up. Don’t forget your original paperwork. Drive on your own terms with Uber. Liability protection1 and standard maintenance are included. Unlimited miles for driving with Uber and personal use. 24-hour, 365 days a year roadside assistance. Is there a minimum and maximum rental period? A seven day reservation is required. You will be eligible to extend your rental up to three times, every seven days. Every 28 days, the vehicle needs to be returned to the Hertz rental branch from which the vehicle was originally rented to open a new 28-day contract. How do I sign up to drive with Hertz and Uber? How do I qualify to rent under the Hertz Uber driver partner program? Have additional questions? Visit our full Rideshare FAQs page for more top questions. 1 While driving off-app, Hertz provides for minimum financial responsibility as required by applicable law, but renter is responsible for all other liability incurred. Uber provides additional coverage for on-app driving. For such Uber coverage in California, click here. For such Uber coverage in all other states, click here. Hertz may not offer any additional protection products, including insurance products. Terms and conditions apply to all protection and insurance products, and coverages may vary depending on local laws. 2 The Hertz Loss Damage Waiver applies to damage to the vehicle itself in excess of $1,000 occurring while off-app or while on-app before accepting a request from a passenger. Loss Damage Waiver terms can be found in the rental agreement, rental agreement addendum, and online. During other on-app periods, Uber provides coverage for damage to the vehicle in the maximum amount of fifty thousand dollars ($50,000) per claim, subject to a $1,000 deductible. Terms and conditions apply to all protection and insurance products, and coverages may vary depending on local laws. 3 At the time of rental, an authorization hold will be secured on your debit card provided to cover the estimated amount of the rental charges and any additional charges that may be incurred. These funds will not be available for your use. When a debit card is accepted as form of payment, at the start of the rental, two (2) forms of identification must be presented. Prepaid or stored value cards issued under a VISA or MasterCard logo are not accepted to qualify for rental. Both debit cards and prepaid or stored value cards issued under a VISA or MasterCard logo may be used as a form of payment when the vehicle is returned. †The credit scoring process performed through the services of Equifax are very similar to the type of credit checks that are done when a person applies for credit. This credit check is done at the rental location when you arrive.